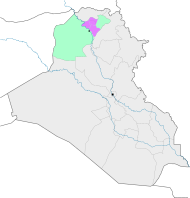 Map of the three districts which constitute Nineveh plains overlaid over the Ninawa Governorate map. Nineveh Plains lie to the east, northeast of the city of Mosul in the Iraqi Ninawa Province. The ancient city of Nineveh stood where the eastern outskirts of Mosul are today, on the bank of the Tigris river. The villages on the eastern part of the plains are inhabited by minority religious groups that are non-Muslim. Most of these inhabitants are Christian Assyrians. The Nineveh plains are not only the historical homeland of the Assyrian people and a crucible of pre-Arab and Kurd pre-Islamic Mesopotamian civilisation, but it is a province where a majority of the population is currently drawn from the minorities, around half of whom are Assyrians. Singara in a detail from Peutinger's map, a medieval copy of a 4th-century Roman original. Peutinger's map of the inhabited world known to the Roman geographers depicts Singara as located west of the Trogoditi. Persi. (Latin: Troglodytae Persiae, "Persian troglodytes") who inhabited the territory around Mount Sinjar. By the medieval Arabs, most of the plain was reckoned as part of the province of Diyār Rabīʿa, the "abode of the Rabīʿa" tribe. The plain was the site of the determination of the degree by al-Khwārizmī and other astronomers during the reign of the caliph al-Mamun. Sinjar also boasted a famous Assyrian cathedral in the 8th century. Following the concerted attacks on Assyrians in Iraq, especially highlighted by the Sunday, August 1, 2004 simultaneous bombing of six Churches (Baghdad and Mosul) and subsequent bombing of nearly thirty other churches throughout the country, Assyrian leadership, internally and externally, began to regard the Nineveh Plain as the location where security for Christians may be possible. Schools especially received much attention in this area and in Kurdish areas where Assyrian concentrated population lives. In addition, agriculture and medical clinics received financial help from the Assyrian diaspora. As attacks on Christians increased in Basra, Baghdad, Ramadi and smaller towns. more families turned northward to the extended family holdings in the Nineveh Plain. This place of refuge remains underfunded and gravely lacking in infrastructure to aid the ever-increasing internally displaced people population. In February 2010, the attacks against Assyrians in Mosul forced 4,300 Assyrians to flee to the Nineveh plains where there is an Assyrian-majority population. From 2012, it also began receiving influxes of Assyrians from Syria owing to the civil war there. In August 2014 nearly all of the non-Sunni inhabitants of the southern regions of the Plains were driven out by the Islamic State of Iraq and the Levant during the 2014 Northern Iraq offensive. The Chaldean and Syriac inhabited towns and villages on the Nineveh Plain form a concentration of those belonging to Syriac Christian traditions, and since this area is the ancient home of the Assyrian empire through which the people trace their cultural heritage, the Nineveh Plain is the area on which an effort to form an has become concentrated. There have been calls by some politicians inside and outside Iraq to create an autonomous region for Assyrians in this area. On January 21, 2014, the Iraqi government had declared that Nineveh Plains would become a new province, which would serve as a safe haven for Assyrians. The area is considered by its Assyrian inhabitants as being the original Assyrian heartland. Other inhabitants are the Yazidis, Shabaks, Turkmens and Kurds. ^ Mardean Isaac (2010-12-30). "The desperate plight of Iraq's Assyrians and other minorities | Mardean Isaac | Comment is free | guardian.co.uk". Guardian. Retrieved 2012-08-17. This page was last edited on 7 April 2019, at 14:00 (UTC).